Cyrus Mono X 300 Signature review | What Hi-Fi? 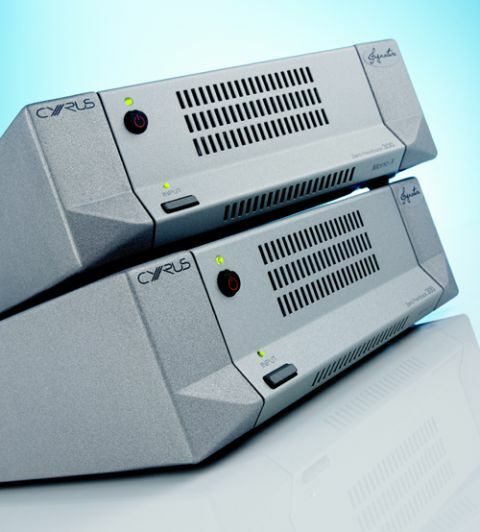 At the start of 2013 Cyrus began celebrating its 30th birthday. To mark the occasion the company launched a limited edition top-end anniversary system. There were just 30 samples of this £17,000 setup. It was based on the company’s high-end X-Series components, but each part was further developed to improve performance. There was a special paint finish, too. These electrical upgrades have now been incorporated into the company’s standard range, giving us the Signature products. We’re starting with the new version of the Mono X 300 monobloc power amplifier. It looks unchanged from the outside, but take the base off – the internals are mounted upside down to take advantage of the rigidity and damping qualities of Cyrus’s trademark die-cast casework – and you’ll find a whole raft of detail changes. These include better quality surface mount components and a redesign of the balanced XLR input circuitry. The new amplifier also has a ‘Signature’ sticker on the front panel. This looks cheap and like an afterthought to our eyes. Since the casing is the same as that which Cyrus tends to use on all its products it follows that the build and feel of the Mono X 300 Signature is little different to that of the £700 Cyrus 6a integrated amplifier. There’s nothing terribly wrong with that, but take a look at top-end rival designs from the likes of Burmester, Chord and Bryston and it’s fair to say the Cyrus feels adequate rather than special at this price level. There’s little sense of high-priced luxury here. Still, there are advantages to Cyrus’s approach. Sharing the casework across a whole range bolsters brand identity, but it also spreads the expense – the casing is usually a huge chunk of the manufacturing cost of any product. This leaves the company able to spend more on the insides, and it’s here that Cyrus, as with previous generations of this monobloc, has done something different. The circuit is an unusual one that’s been refined over a decade or so. It uses no overall feedback in the design, preferring instead to limit it to the smaller amplifier gains stages individually. This means that whatever happens at the output doesn’t affect the input, which makes the amp less speaker dependent. There’s long been a belief among many designers that feedback (while technically a good thing) doesn’t always produce the best sound. Designing a circuit with no overall feedback is hard to do, which is why so few transistor-based amplifiers are made this way. Time to connect these monoblocs into a system. We used our usual Bryston BP26 preamp along with a Cyrus DAC XP Signature as the controllers with Naim’s NDS/555ps streamer and Burmester’s 069 CD player as sources. We also deployed a range of speakers, focussing on ATC’s SCM 50s, but also including Quad’s ESL 2812s and KEF’s LS50s. Regardless of the speakers used, these Cyrus monoblocs sound terrific. We were big fans of the original X 300, but compare old with new and it’s clear that the company has taken some huge strides forward. We praised the original for its resolution and agility, but the Signature version is easily better in both respects. It now sounds faster, clearer and significantly more articulate – some praise considering the original was already among the best in these respects. There’s also greater refinement here, and the kind of fluid delivery that’s very rare in non-valve amplifiers such as this. The Cyrus continues to excel no matter what kind of music is played. We listened to everything from Holst’s Jupiter to Kanye West’s Yeezus set, and the Signature always sounds at home. Despite its compact dimensions this amp can deliver oodles of power – its claimed output is 225W – and got high levels from every speaker we tried. It’s composed when pushed hard and can deliver impressively wide dynamics and exhibit plenty of punch with it. Play Kanye West’s I Am A God and the Cyrus delivers this hard charging track with real force and determination. Most rival power amplifiers can do much the same, but where the Cyrus excels is in its ability to combine this muscle with agility, precision and rhythmic drive rarely heard with high power amplifiers. Time and again we were pleased by the X 300’s muscle but stunned by its insight and subtlety. Partnered with just a modicum of care it delivers delicate dynamite – a truly rare combination. We know that people buy with their eyes as much as their ears at this or any other price level. The Mono X 300 Signature’s rivals will invariably be bigger, heavier and more luxuriously finished, and if these qualities are paramount there’s plenty of choice. However, if you want a wonderfully informative amplifier that communicates the drama in music in a really articulate and precise way, we haven’t heard better for the money.